Now, more than ever, brands are bringing more empathy to and across their customer engagement marketing with content. The winners aren’t making their brands, products and services the hero of the tale. The customers, employees and prospects are the centers of their stories, and the experiences designed for the hero’s journey exist to make the user win the day. Clients need less from agencies telling them they need to create more content, more disconnected touchpoints - more complexity in their ecosystems. We’re here to help you build or refine your content capability to create purposeful audience-centric experiences that create customer and business value. 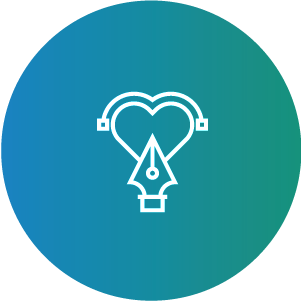 At Empathy/CX™, we’ve seen the crafted combination of empathy and utility make for great customer experiences that create value. Our vision is to be a leading creative content experience agency - a strategic partner to national brands, growing regional and local businesses. We aspire to be the destination (or connected gig partner) for the industry's most talented, ambitious, empathetic and enthusiastic strategic and creative professionals. Headquartered in Greensboro, NC, we will always be where our clients need us to be, as they wish. Our approach is to engage seasoned professionals with informed perspectives to drive efficiency and effectiveness of content capability as a strategic component in a brand’s overall integrated marketing functionality. We hold to one set of truths for ourselves: Empathy generates the insight to inform ideas that become useful solutions to creating value. Develop great ideas and deliver creative content experiences for our clients to help them achieve their audience and business objectives. Committed to great work, engendering empathy, inclusiveness and diversity, creativity and innovation, and continuous growth for our team and partners. Support and nurture one another as a team – to build our skills and careers, achieve our dreams, do great work, enjoy balance and flow in our lives, and provide for our families. Provide servant leadership to all partners. Imbue empathy into our culture and all work. Care about the team and our Clients (the people, the businesses, the customers) and make everything better, every day. Design and lead teams in strategic development and program delivery.